Over on the Cacti & Succulent forum I participate in the questions on how to propagate succulents comes up often. And like a lot of things that have to do with gardening it seems to be shrouded in mystery for the beginner and even for some people who have experience with growing houseplants. The truth is that it couldn't be easier to and in many cases the plant will do it on it's own. The photo below I took today of an Adromischus that I own that has a leaf rooting while still attached to the plant. The leaf had been almost knocked free from the plant while I was moving it inside for the winter. Notice the roots that have developed from the dangling leaf, but ignore the dust on my plant :0) If you're not lucky enough to have a plant doing all the work for you can remove a leaf to speed up the process. I find it's easy to just hold the leaf by the base right where it's attached to the plant and twist and pull in a swift motion. I'll then sit the leaf in a bright area away from direct sun and let the cut heal for about 4 days. After that I'll simply lay leaf on the soil surface of the pot I want to grow it in and mist often. Again I'll keep them in a bright area away from direct sun (to avoid drying of the leaf) and once I notice the roots start to emerge I cover them with soil and continue to mist often until I see new growth. By the time new growth emerges it's time to water like I normally would and prepare the plant to move to it's regular location with more light. In time you'll have more plants than you could shake a stick at which you could then share with friends, sell or even better- donate to charity to be used for fund raisers. Propagating your succulent plants couldn't be any easier; if you don't believe me check out these previous blog entries and see this method work with an (right-click the links to open in new window) Echeveria and a Kalanchoe. With the Echeveria I was creating back ups because the main plant had mealy bugs. In the case of the Kalanchoe it was a pleasant surprise as I had forgotten about the leaf. This method for propagation won't work with all succulents, because a lot of succulents don't have leaves, but it should work with a lot of the plants you find in your garden centers. I wanted to thank you from the bottom of my heart for showing me how to save my baby. My fiance and I bought this pretty little succulent when he first moved in, a pretty little graptopetalum pentandrum with a pale green coloring to the stalk and the new leaves that had just sprouted that turned a dusty purple. It had been growing well and, ironically, while we were having a huge fight it fell over and broke in two, leaves everywhere. We truely felt it had died and that our relationship would be soon to follow. A few days later we noticed the base of the stalk, still left in the pot, had sprouted a baby! From that alone we felt we had some hope for ourselves. It's been two weeks, and after a ton of searching we found your guide and are now on our way to fixing ourselves and our little plant! m speechless. I can just say thank you for one of the most touching comments I've ever encountered. Good luck with everything. One day I was watering my husband's favorite echeveria when I lifted some of the leaves off... and the entire top of the plant just fell off! I tried to follow your instructions on salvaging the plant from its leaves, and I've misted them lovingly every day, but it's been a month and all that's happened is the leaves have shriveled up slightly. Am I just being impatient, or are they toast? Sorry for the late reply. Any further news with your attempt at propagating the succulent plant by using the leaves? hello. i have a larger aloe plant that has recently rotted from the base stem. is there still a way to keep this larger top portion of the plant and re-grow base roots on it kinda like a leaf cutting? i hate to get rid of this. Yeah, remove the lower leaves and cut off the rotting part of the stem and root that. You can't root Aloes from leaf cuttings but if you find healthy stem you can root it. Hi there! I took cuttings from an E. 'Perle Von Nurnberg' and an E. Peacockii last week, and am really (really really) excited to see them grow. Can you tell me about how long it should be before I see plants growing off of them? Two weeks, a month? And can you tell me (in your experience)what percentage of the leaves usually sprout plants? 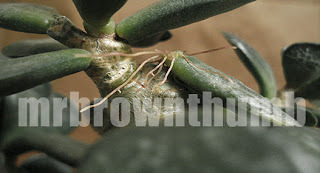 Within about two weeks you may see a root or two and within a week some plant growth. How long should it take for leaf cuttings to grow new roots? I have had some going for about 3-4 weeks and I'm not seeing any new growth. What am I doing wrong? I really want to use these for our wedding centerpieces but I'm afraid I won't be able to get them to grow. It could take a few weeks to over a month for a succulent cutting to grow roots. It all depends on how fast the succulents grow, what time of years you're propagating the plant, and temperature. Thanks for the how to. My MIL has about 8 kinds of succulents growing (now wildy) on her roof. She has been keeping her little garden but due to health issues has been up there in quite some time. Some are bustingout of thepots at the roots/over crowded etc. Its a wonderful sight to see. I wanted to repot some cuttings in smallerpots to bring indoors for her to enjoy (she has an open stairway to the roof that gets direct sun) , since she often asks me about her abandoned garden. Just today I repotted some cuttings , but I think I did it all wrong. Oops! I have some repotted that I just cut off at the stem (like the top half of the plant) that are the echeveria ones, do you think those will grow like that? I hasically lopped of four of the blooms and put them in a new pot. Hehe. Should have googled first I guess. Take a look at the post on propagating an echeveria http://mrbrownthumb.blogspot.com/2007/08/restarting-echeveria.html if you did it anything like that you should be OK.
Hi, I am new at caring for succulents. I have one E. Dark Prince and I became confused when after I watered it the next day it looked like it was dying (a bit). I don't know what I did wrong. Hi. I have the same problem as Michelle. So to root the top part of the damaged aloe should it be put in water or soil? Thank you in advance for your answer. How do you re-root the top good piece of an aloe plant whose stem went bad near the bottom of the plant? So happy to find your site. Great article. I just rescued a leggy echeveria that was in need of TLC. On the drive home it tipped over and lost several leaves ( I had to brake unexpectedly). I ended up repotting it the next day since it was top-heavy.& several leaves were naturally about to fall off. After cutting the stem in half I left the bare stalk in place & laid the shed leaves on the soil. The upper portion has 5 or 6 attached leaves so I laid that on the soil as well. The pot is on the deck is in an area that gets filtered / morning. I'll give them a light mist when needed but the soil was too water logged when I got it. After reading your post I think I did the right thing. Before marriage, kids,& a couple of cross country moves I had a house full of plants. I'm rebuilding my plant collection and my memory is rusty. Your posts and input are greatly appreciated.